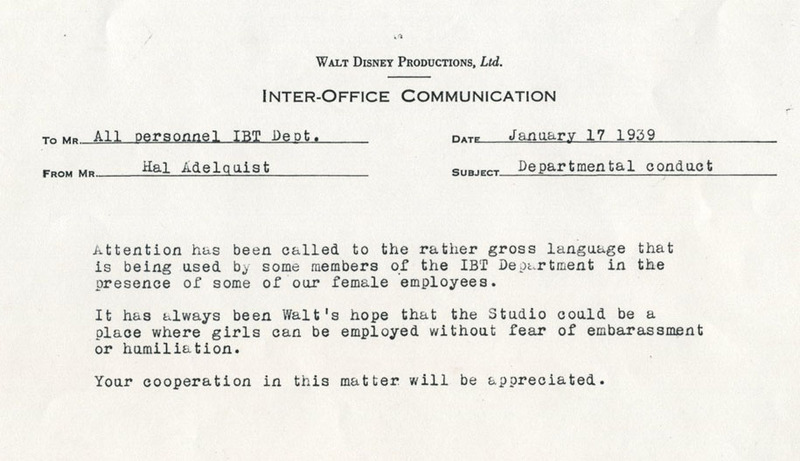 A while back, Feministing pointed out this unfortunate example of sexism from Walt Disney Studios in the 1930s. Attention has been called to the rather gross language that is being used by some members of the IBT (Inbetween) Department in the presence of some of our female employees. 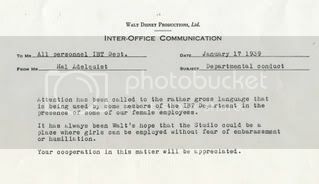 It has always been Walt’s hope that the studio could be a place where girls can be employed without fear of embarassment or humiliation. Your cooperation in this matter will be appreciated. Being the junior feminist that he is, Dan pointed out that the memo still referred to female employees as "girls", and that its format only allowed writers to address each other as "Mr.". I'm sure I would have seen that, too. I was just too busy noting the misspelling of "embarrassment". That "girls" really stuck out to me. Maybe I'm not a male anti-feminist troll, after all!